A new programme where we will invite artists to share about their lives, passion and experiences. Coffee Talk offers an opportunity for audiences to be up close with the artists by sharing their stories. We believe this will inspire the audiences to pursue their dreams. Art is all about sharing! Presented by DPAC. Venue sponsored by Tous les Jours, Empire Damansara. 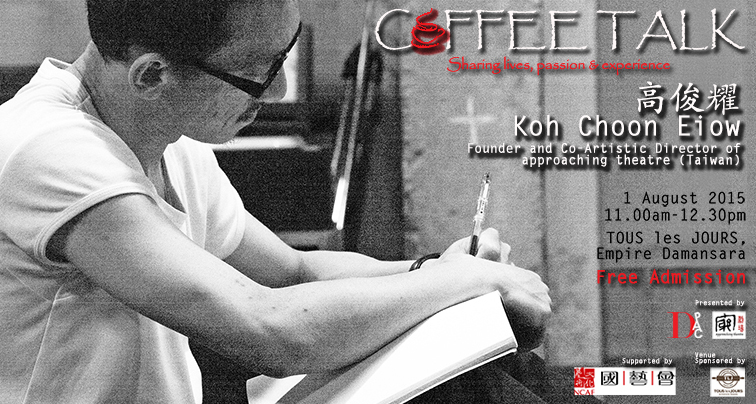 Koh is a theatre director, writer and actor from Malaysia. Having graduated with a Master of Fine Arts degree from the Chinese Culture University, Theatre Arts Department, he is an active figure in the Taiwanese theatre scene, creating theatre works as well as education. His works explore the alienation of human beings in a contemporary society. His narratives are well known for their accuracy and distinctive styles and they have received various awards and nominations. For instance, “Chronology on Death” which has toured across Taiwan, Macau, Malaysia, and Singapore has won the Guling St. Avant-Grade Theatre “Annual Audience Choice Performance” Award (2011) and was nominated for the Performing Arts Category in the 10th Tai Shin Art Award (2011). **Kindly RSVP on Facebook event page if you are interested to attend. Founded by Chew Soon Heng (Boyz) and Leow Sze Yee (Zyee), both of whom performed with world renowned performing group – Hands Percussion for more than ten years. Orang Orang Drum Theatre combines drumming, body movements and theatre to create their own unique works with the aim to create performances that will bring the public closer to art. They believe that art is a good way of bringing people together to listen, to see, to feel and to share with one another. They have just came back from Venice Open Stage with full of inspiration and energy! Come join them at Coffee Talk where they will be sharing with you about their journey and exciting experiences they have gained at Venice Open Stage. HANDS Percussion Team has thrilled audiences at numerous international performances in Southeast Asia, China, Europe and the Middle East. They merge extracts of musical elements from a diverse range of musical cultures, rhythmic drumming, and synchronised styled/creative movements manifested from musical gestures into their performances. HANDS has brilliantly fused sound art and movements as well as visual aesthetics, striving to achieve world-class standards and bring out their very best everywhere they perform. Join us at Coffee Talk to find out more about the team’s experiences and inspirations they got during their recent European tour!